As a kid, growing up, I had a lot of cousins. There were fourteen of us on my father's side and three of us on my mother's side. My mother's side was made up of my oldest cousin Michael, me in the middle, and Samantha who was the youngest. I worshiped Michael growing up. He was a few years older than me so there wasn't much cooler than hanging out with him. He had the coolest toys, the latest Intellivision games, and was just about the funniest guy imaginable. Even today, while he is a man of few words, when he does talk it is almost always side-splittingly funny. 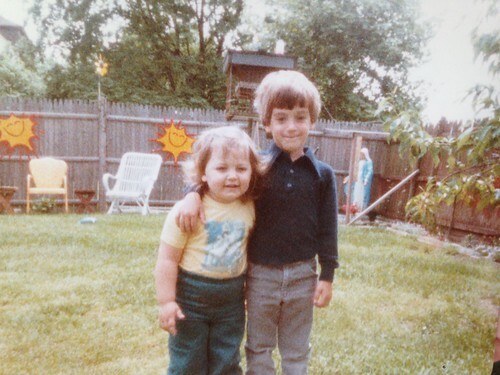 Samantha was a few years younger than me and always looked up to me and Michael who she referred to as "Bralphie." At least I think that's how it's spelled. I don't think it's ever been written out before. She loved spending time with me though she was hesitant to at times. Spider-Man and my father were usually part of hanging out with me and both of those things terrified her. Spider-Man, presumably because of his weird, bug-like eyes. My father because of his huge bushy beard. I got a call the day after Easter from my mother. She told me that my cousin, Samantha, had passed away. It was a shock. While we lived more than a thousand miles apart we kept in touch via Facebook and she frequently commented on the blog. Instantly there was grief and sorrow but I was surprised by the first thing I thought of. I remembered a time that I deeply regretted. The three cousins were together at my Aunt Pat's house and for some reason I was being foisted upon either my Aunt Pat or my Aunt Deb. For some reason they made me decide where I wanted to sleep for the night. On the one hand I could sleep over my cousin Michael's and hang out with him and play some of the cool Intellivision games I didn't have. On the other hand I could sleep over Samantha's, something I knew would make her really happy. No one tried to tell me what to do. The decision was all mine and I hated it. It's the earliest memory I have of knowing I could do something to make someone else really happy. 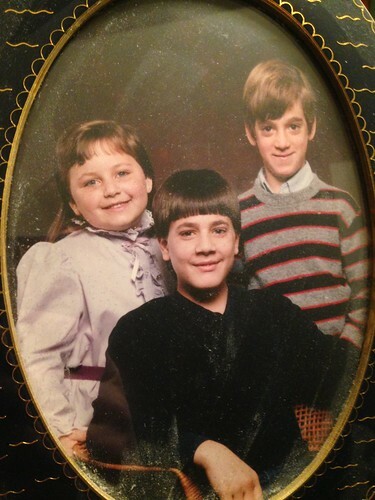 All I would have had to do was sacrifice a night of playing some sweet Intellivision games with my cousin Michael and I could have hung out with my little cousin who I was very fond of. Of course I chose to go to my cousin Michael's. I was only about seven years old and I just didn't have the self control to be able to pass up such a rare opportunity. I felt bad about it at the time and I've felt bad about it ever since. I wondered if anyone but me remembered that incident. It seems unlikely but for me it was a defining moment in my life. It taught me that living with the regret of not doing a small thing to make someone happy is hardly worth any short term selfish fun you can have. I don't remember playing those games on that specific occasion but I have never forgotten letting my cousin down. It would have been such a simple gesture that would have made her so happy. As I got a chance to meet with family a couple of weeks ago I was reminded of how important I was to her and how important she was to me. Distance couldn't change that and I'm sure that silly little incident thirty years ago couldn't either. She gave me a beautiful framed version of that picture above some years ago. She was always fun, funny, and full of love, remembering those childhood memories with a vivid nostalgia that none of the rest of us could match. Returning back to Illinois after my trip back home we were faced with the horrible and inevitable task of having to get a minivan. For people with fewer than three children their immediate question is: "Why would you ever do that?" The answer is obvious to anyone who has more than two children (or has done the math on having more than two children) is that there is no way around it. You cannot fit three car seats in anything else. Sure, you could get one of those gigantic SUVs but nothing can match the ease of having sliding doors on both sides. Also, with a minivan you can stand up in the trunk. I'm not really sure why that's useful but it is pretty amazing that it can be done at all. I was shocked that none of the salespeople brought it up as a selling point. 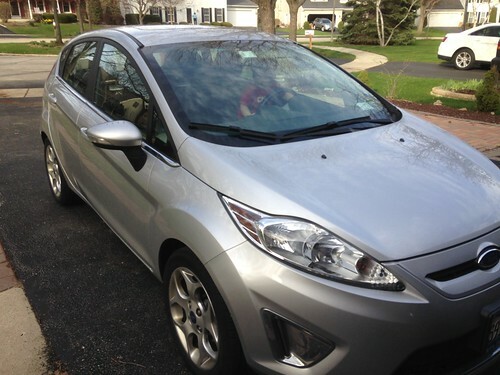 Prior to deciding on a minivan, Jen bought a baby for Elliott to match the baby Martin had requested about a year ago. Elliott liked the baby okay. When we asked him her name he immediately answered, "Laura." We found this interesting because we're not really sure how he even knows that is a name. After playing with the doll for a few minutes he became much more interested in the diaper bag that came with it. In particular it came with a fake cell phone which became so popular that it had to be confiscated prior to bedtime. That move was not quite as popular. Last Thursday, Jen took one for the team and spent the entire day at the dealership going through the horrible song and dance that is buying a car. Eventually she returned home and the boys went right to work inspecting it to make sure it met their specifications. After returning home from Rhode Island I was sure to make the boys some coffee milk to celebrate their ancestral heritage. 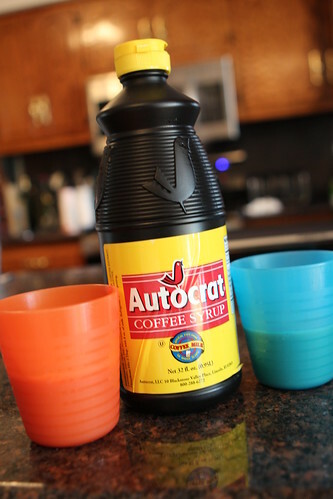 Coffee milk is a uniquely Rhode Island beverage. It is neither coffee with milk in it, nor is it milk with coffee in it. Instead it is a sweet coffee syrup that you mix in with milk much in the same manner one would make chocolate milk. On Sunday I made them some with their pancakes and they enjoyed it the way any children descended from true Rhode Islanders would. After nap time we had a massive coloring session while Jen ran to the store. Elliott was able to color Firestar, something I had to scour the internet for as Firestar is not exactly Marvel's most successful franchise and didn't really make it into many coloring books. She is, however, Elliott's favorite superhero so we will be manufacturing Firestar goodies for him for as long as that remains true. uncle Dee Dee arrives. 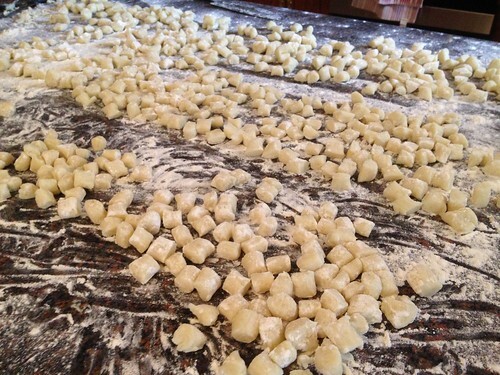 I made 10 potatoes worth of gnocchi and several pounds worth of granola. I planned on making many more things in the coming weeks to load up into the freezer. Then Jen had her doctor's appointment. Jen was told she'd have to go to the hospital after her doctor's appointment on Monday to be monitored. Right after telling her that she could go home on Tuesday morning they told her, "Just kidding, you need to have the baby right now. Today!" So it was that I ended up racing home from work to the site of my wife wildly writing stories for work before delivering a child. 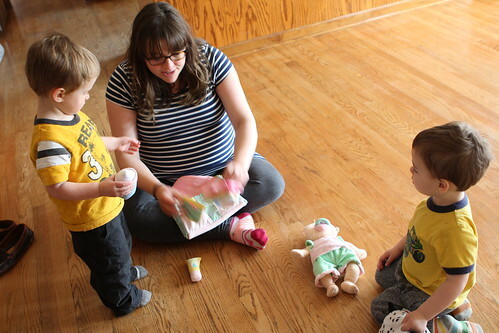 This was a tradition dating back to her last unexpectedly rapid progression into childbirth in 2012. Uncle Dee Dee arrived very quickly and after spending the time leading up to delivery debating we agreed to name her Josephine. There is some debate as to whether that will stick with Dee Dee being so stuck in the consciousness. However, after searching many bogus lists for names that pass themselves off as having Dee Dee as a nickname, it may as well be a nickname for Josephine as well. In fact, now it sort of has to be. After 24 hours the boys descended upon the hospital, stomping through the halls and talking at unnecessary and inappropriate volumes for indoors. They brought presents for the baby and for their mummy. Auntie Lauren and Grandma were thrilled to get a chance to meet Josephine and hold her. The boys were thrilled because any time Auntie Lauren is involved with watching them they get a huge dessert course before and after dinner. It's hard to top that. The boys were pretty interested in meeting their sister after getting to tell all their friends at daycare about it all day. April has been full of surprises; some good, some bad. It is sad to say goodbye to my cousin Samantha who I know would have enjoyed reading this and seeing the pictures of little Dee Dee. Yet it is nice to welcome Josephine, however unexpected. Her early birthday means she'll be treated with an Easter birthday when she turns four and again when she turns fifteen. That will be an exciting experience for her and something not everyone gets to enjoy. 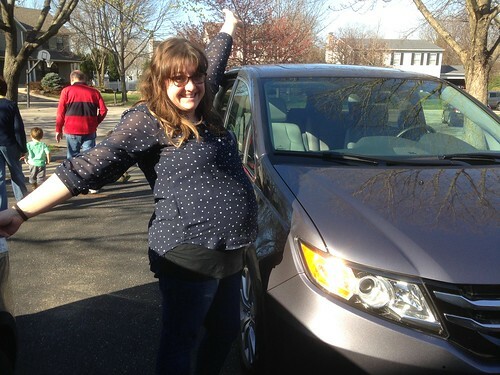 Our minivan arrived just in the nick of time. Tonight we do the car seat test with Josephine and will be leaving the hospital either tomorrow or early on Friday. It has been a strange experience to be alone with Jen in the hospital with a single baby. It is surreal. It feels like we're doing some weird do-over where we try this whole thing again with just one child. While there's been no time for sleep there's also been a lot of time just holding the baby or sitting around and talking. A strange sensation took over this afternoon, something I haven't felt in years . . .
You don't get a lot of time to get bored with a full time job and two toddlers at home. I'm not the kind of person who likes being bored but I have to say it was quite refreshing to experience boredom today even for a short span of time. I savored it. I'm looking forward to experiencing it again in 15-20 years.